Injinji have just brought out the Spectrum range of brightly coloured toe socks and I was asked if I would review them. I’m already a convert to toe socks, using them for most of my ultras and enjoy the opportunity to freak people out with my monkey feet. I therefore said yes very loudly. I’m already a convert to toe socks for running long distances. I find them super-comfortable - no seams and having the fabric between my toes stops blisters there. 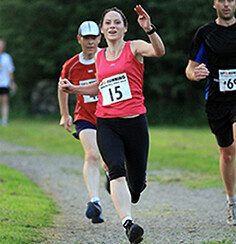 Also in true ‘glamourous ultra running’ style I find that running long distance makes my feet swell up. (Told you I was glam, right?) 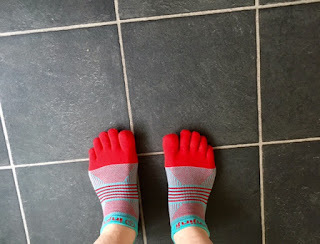 Toe socks allow my feet to expand and means I can spread my toes out a bit more in my shoes. And as well as improved comfort this also means I get to keep more of my long-suffering toenails. They pretty much eliminate between-toe blisters. Don’t have to tape & retape feet in races or apply massive dollops of nappy-rash cream which incidentally is almost impossible to get off a green carpet. Lovely having pretty socks. I know this shouldn’t be important but nice kit makes me feel better. There’s definitely a place for more muted colours (funeral runs, library runs, Saltmarsh 75 ...), but I prefer the bright colours. I wasn’t sure about the low-rise ‘no-show’ profile but because the socks are held in place on your feet by the toe sleeves, they don’t shift or drop down in your shoes. 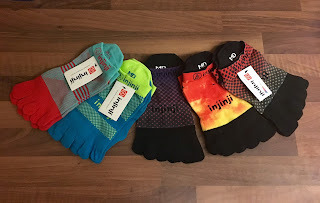 I wore 1 pair of Injinji socks for a 100 mile race. I can’t even tell which pair as they’re not obviously worn or damaged. These socks stand up to a lot of abuse. I only ended up with 1 blister. Although it was a pretty impressive one. And had a toenail floating in it. After 6 - 8 wears and washes they're still looking good. 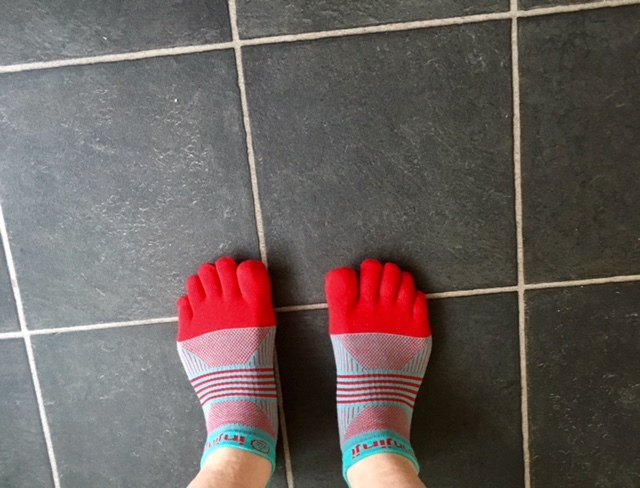 Toe socks make your feet wider due to additional material so be wary of this if your feet swell very much on hot days or long distances. I’m ok except on the very hottest days. Slow to put them on. I wouldn’t use them for triathlons, but wouldn’t go without them for ultra marathons. Some people are freaked out by monkey feet. However you can embrace this and use it to freak out your competitors. Make sure you know where you left your trainers though. 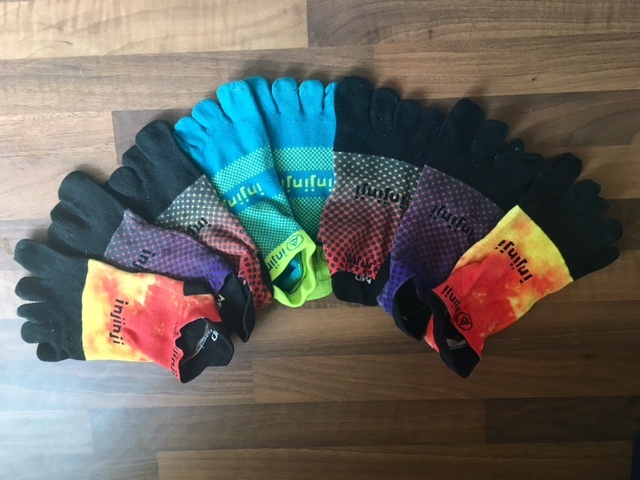 The Spectrum colour is supposed to be fade and distortion resistant but there are areas on the socks that have slightly faded on several of the pairs slightly. However it is very slight and this is after probably 6 or 8 washes. I’m tempted by a Hawaiian pair of the Spectrum socks. I shouldn’t be allowed to wear Hawaiian clothes as this leads to me drinking cocktails and wearing grass skirts. Bad. Some wear, fade on the heels. Get your own here. Or buy me the Hawaiian pair. (Yes I’m looking at YOU, Auntie Jen who always asks me what I want for my birthday). These are cute! I have never tried toe socks but never say never! Is an update still an update if it's late?